The players assume the roles of the royal houses of Lancaster and York, who fought the War of the Roses (both sides sported a Rose on their arms) between 1455 and 1485 for control of the throne of England. Each will try to bring the largest areas under their control. The winner of the game is the player with the largest contiguous areas marked with his color of Rose. 52 doublesided markers ('powerstones' with Red Roses on one side and White Roses on the other). 24 power cards (there are three cards for each of the 8 directions, one each of value I, II, III). 8 Hero cards (4 for each side). Five power cards are dealt to each player (randomly). You cards are visible below the board and the cards of your opponent above the board. The rest of the power cards are placed face down beside the board as a draw pile. Each player receives the four hero cards of his color – they are placed on the left of the power cards. The crown marker is placed on the center space of the board. The Red Rose player begins the game. Thereafter, players alternate turns. 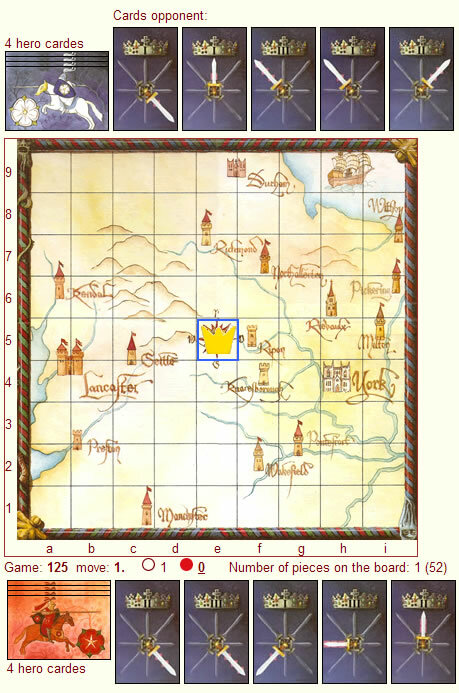 See figure below for the board at the start of the game. 1. Play a power card. 2. Draw a power card. 3. Play a hero card and power card together. You have to take one of the above actions. Only if a player cannot take any of the three actions listed above, he is allowed to pass his turn. His opponent takes another turn, and will continue to do so until the other player has a legal move. The crown marker must move the full amount shown on the power card. You may not move the crown marker fewer spaces than shown. The space the crown marker moves to must be empty. That is, there cannot be any powerstone of either player in the space. You may not play a power card which would move the crown marker off the board. Before placing the crown marker on its new location, a powerstone with your color Rose showing, is placed on the space. The crown marker is placed on top of this powerstone. The power card is placed on a discard pile. Instead of playing a power card, you may draw a power card from the draw pile. You may only choose this option if you have fewer than five cards. The new card is placed face up. When the last card is drawn from the pile, the discard pile will be shuffled and a new draw stack with it will be created. Each player has four hero cards to use once each during the game. If you have used all four hero cards, you may no longer choose this option. Use of a hero card allows you to move the crown marker to a space containing one of your opponent’s powerstones. This power stone is then flipped to your color before placing the crown marker on the space. Thus a hero card is very powerful when played. You play a hero card (with a power card) by placing the stone to a place occupied by a power stone of your opponent following the rules (distance and direction) of the power card. When a player places the last powerstone on the board (remember there are 52 of those stones). In both cases the game ends immediately. 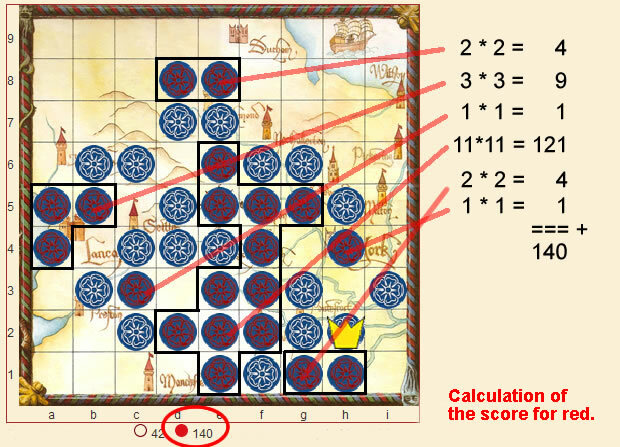 The player with the highest score wins (see below for the calculation of the score). A territory consists of one or more spaces containing your powerstones connected across at least one side. Spaces adjacent only diagonally do not count as connected – they must share an edge, not just a corner. Multiply the number of spaces in a territory times itself to get the value for that territory. Add the points from all areas to get a total score. The winner is the player with the highest point total. In case of a tie, the winner is the player with the largest single area. If still tied, the winner is the player with the most powerstones of his color on the board. See below for an example calculation.